I just want to add an article that gives the URLs for downloading the SDK and the Toolkit for Apps for Office with Visual Studio 2012. It’s not easy to keep up the pace and find the required tools so this is also a reminder to myself. Axialis Pure Flat 2013 Toolbar Stock Icons Rock! A software program’s success is usually depended on its functionality, i.e. it does the work and it has a user-friendly UI. In fact, the UI is the most important part of applications as that is what the end-users see and work via. This is something we all known (or at least should know). Among the components that make up the UIs are icons. Icons should give the users an understanding about the functions that are hidden behind the icons. When Microsoft changes the UI for its Windows operating system it also affect the design on icons. With Windows 8 we have got a new UI style, the Metro style. The new style of icons can simple be named as flat. Axialis, the vendor of the tool IconWorkshop, offers also excellent icons. At least that’s my opinion, therefore I would like to push for their new series of Pure Flat icons. Bill Jelen, MrExcel, has marked this week to honor the VLOOKUP function in MS Excel. Around the online Excel development community You will find contributions, usually blog posts, that gives various aspects for using or not VLOOKUP. I thought it would be interesting to create a case and see how VLOOKUP can be part of VB-solutions. Actually, for several years ago I did similar solutions but with classic VB (VB6) for a customer. Imagine that we have a price list for our products. Because of the frequent price updates the company has decided to store it in a MS Excel workbook. To keep it very simple for the sales staff they use a standalone VB-solution where they select products, retrieve the price for each product item and add some additional information manually to get a total price. 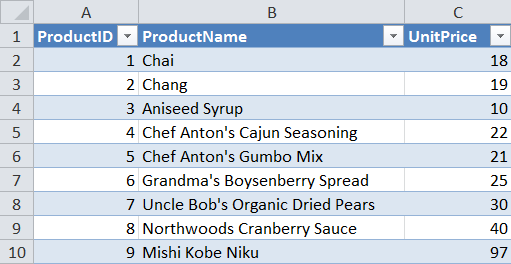 As most Excel developers should know, we can acquire data from workbooks in several ways. The most common approach is to treat the workbook as a flat database table. Technically we either use classic ADO or DAO to connect to the database table and using a SQL query to get the wanted records. This is a smooth solution but it assumes that the ADO/DAO library is available on all computers that will use the solutions. To avoid a situation where we must check if the library is installed or not we can use a solution where we automate Excel and execute the VLOOKUP function to get the wanted data. Practical we get a robust solution that is not depended on ADO/DAO and when working with small data sets the performance is fully acceptable. As we can see it’s a simple table that is manually updated. As You can see it’s a simple tool to work with. 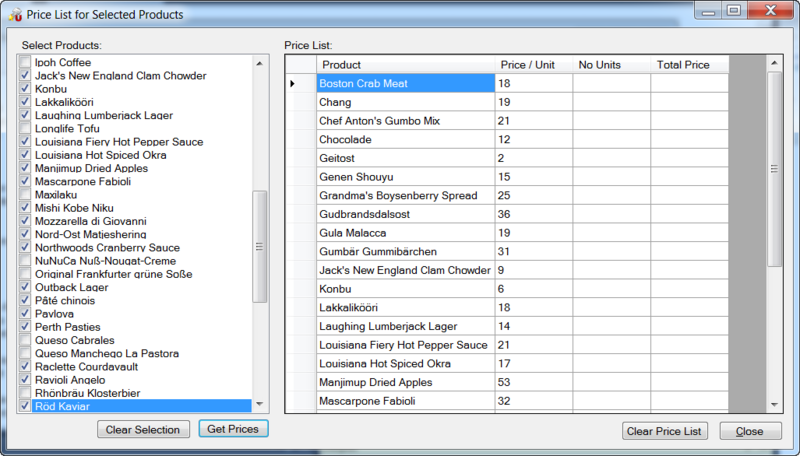 The last piece of the solution is the code I use to retrieve the prices and populate the DatagridView with. Dim File As String = "'" + Location + "[P_List_2011.xlsx]ProductList'!R1C2:R78C3,2,0"
'Here we do the lookup based on the selected product name. Edit: I intentionally used the XLM macro program to show that we can still use it and with VB.NET. I thought that someone would point out that it can also be done by using xlApp.WorksheetFunction.VLookup. My friend Ken Puls, ExcelGuru, finally pointed it out. This is a notification about a recent published article by Patrick O’Beirne on his blog. Patrick has compiled a list of resources, for native Excel developers, to develop User Defined Functions (UDFs) with ExcelDna in VB.NET. For some years ago several developers in the online Excel community made quite often critical comments and rant a lot about using .NET for developing Excel solutions. Today the opinions are slowly changing to a more positive review of .NET which I welcome very much. Of course, it exist other tools as well. For instance Add-in Express for Microsoft Office & .NET, which is a RAD tool that allows us to develop many different .NET solutions for Excel. Personally I prefer this tool than any other, it does all the hard work and allow me to set focus on the core in .NET solutions. It’s also the most powerful RAD tool and is unique.